"These elements have been a challenge," said Lt. Col. Daniel Bugbee, commenting on wind gusts up to 45 mph and freezing temperatures. "It's actually good training though, because the weather will almost certainly not be ideal if we were called to a real-world disaster." 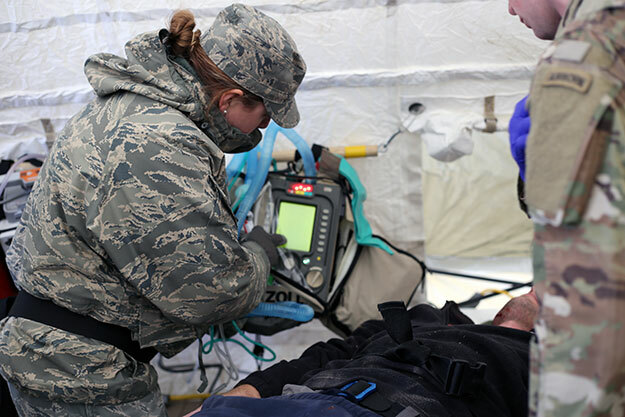 The Washington National Guard's 10th Homeland Response Force traveled to Boise, Idaho, to participate in Idaho Response 2019. The exercise simulated a response to an earthquake with a potential toxic chemical release in order to evaluate the different elements. A Homeland Response Force (HRF) is a regionally aligned Chemical, Biological, Radiological, Nuclear, high-yield Explosive (CBRNE) asset established to support and enhance local, state and federal emergency managers. The HRF provided command and control of the CBRNE Enhanced Response Force Package, which was composed of members of the 420th Chemical Battalion, commanded by Bugbee. The elements at the training site were then broken down to CBRNE Assistance Support Element (CASE), search and extraction, decontamination and medical personnel. "I haven't done this in five years so I am relearning skills I haven't used, and some processes have changed a little," said Staff Sgt. Angela Lord, a team lead in the decontamination element. "I appreciate that we can train like this. We can go a little bit slower and really refine our process to make sure we aren't missing anything." In an emergency that would require an HRF response, Guardsmen from the different disciplines would most likely augment with their local first responders. The CASE would provide security and assist with moving wounded personnel to medical providers. The search and extraction team would assist with removing remains. "Search and extraction personnel are trained through a course on how to enter into a collapsed or at-risk buildings, subterranean evacuations, and they were bracing a wall," said Bugbee. "So if a building needs to be entered that is not secure, they are going to brace it first, and they can build the bracing on scene before entering to extract the casualties." The decontamination element is comprised of two lanes that process those who may have been exposed to a toxin. The lanes are broken down into persons that can walk and those that cannot. The decontamination process is simple: undress to walk through the washing station, go into monitoring to be evaluated and either go to redress or repeat the washing station until the substance has been removed. The CERFP included both Army and Air Guard members. Bugbee said that he has worked with Air Guard in the past, but mostly with air controllers or medical elements. "So it is unique to have such a robust Air Guard element under my command. They bring different assets to the fight and it's good to know what those assets are," said Bugbee. "Because in today's environment, it's very much a joint one." Training on all of these skills is crucial in order to be prepared for a catastrophic event. Using the time to go through the processes will save lives in effected communities.